Bonnie Aarons stars as you-know-who in The Nun. Well, “new” as in “new to recent horror cinema.” The monster in question has actually been spawning nightmares for generations, as we learned at New Line’s “ScareDiego” horror presentation at Comic-Con last night. And, of course, we also caught up with It’s Pennywise and the glowering star of The Nun. It: Chapter Two was up first; since the movie is currently filming, there wasn’t much to share beyond a taped message from director Andy Muschietti (who gleefully said the movie’s going to be so scary, you’ll need to “bring your adult diapers”) and a behind the scenes montage that was, understandably, mostly footage from the first film. That said, we did see video of the sequel cast at their first table read, as well as a few very brief glimpses of them in character. The one that stood out the most looked like it was from the key moment when the grown-up Losers’ Club reconvenes for the first time, choosing to hold their reunion at a Chinese restaurant. Bill Hader, who plays jokester Richie Tozier, looks around at everybody, grimaces, and says “So—what do you guys want to talk about?” We didn’t get many new looks at Pennywise, but we’ve already been totally convinced of how scary he is. It: Chapter Two is out September 6, 2019. Next up, the guy behind the Conjuring universe, James Wan—who still has time to get giddy over horror, even with all the Aquaman hype—came onstage. The film he was there to talk about isn’t part of the Conjuring franchise, but it looks to be very much in keeping with the tone of those films: The Curse of La Llorona, a far more evocative choice than its previous title, The Children, especially given its focus on the sinister weeping ghost that’s a well-known figure in Mexican folklore. Director Michael Chaves, who’s making his feature debut with the film, talked it up with help from cast members Linda Cardellini, Patricia Velasquez, and Raymond Cruz, and showed a trio of clips. The movie is set in the 1970s, and Cardellini plays a Los Angeles social worker who’s also the single mother to two young kids. In the clips, we got some very good looks at La Llorona, who works a tattered white veil and gown and some gnarly fingernails as she menaces various children and eventually Cardellini’s character, too. The whole movie looks like it’s basically “cute kids in peril,” which would be scary enough, but the villain is exceptionally ghoulish, not to mention fond of popping up for well-timed jump scares. Chaves explained that he wanted The Curse of La Llorona to have a 1970s true-crime feel—a period setting that just happens to echo those of both Conjuring films. It’s out April 19, 2019. The final film of “ScareDiego” was spin-off The Nun. It’s set in the 1950s and investigates what demonic nun Valak was up to before she started tormenting Lorraine Warren in The Conjuring 2. Wan, director Corin Hardy, and writer Gary Dauberman (whose many other credits will soon include writing and directing a third Annabelle movie, the plot of which will explore how the doll from The Conjuring disrupts the Warrens’ collection of haunted objects; it’s due out next summer) were representing the film, along with actors Taissa Farmiga and Ingrid Bisu. The casting here is kind of perfect—Bisu is actually Romanian, which is where the film is set and was filmed, and Farmiga is the younger sister of Vera Farmiga, who plays Lorraine Warren in the Conjuring movies. Not present, but prominent in the clips that were shown, was Demián Bichir, who plays the Vatican’s top choice to investigate the strange, seemingly unholy goings-on at a remote Eastern European convent. We kind of know the Nun’s general bag of tricks already—she’s really good at ominous looming, not to mention materializing out of the shadows—but the movie looks exceedingly atmospheric and even kind of surreal, and perhaps it’ll get into why Valak ended up going totally Exorcist rather than Sound of Music. 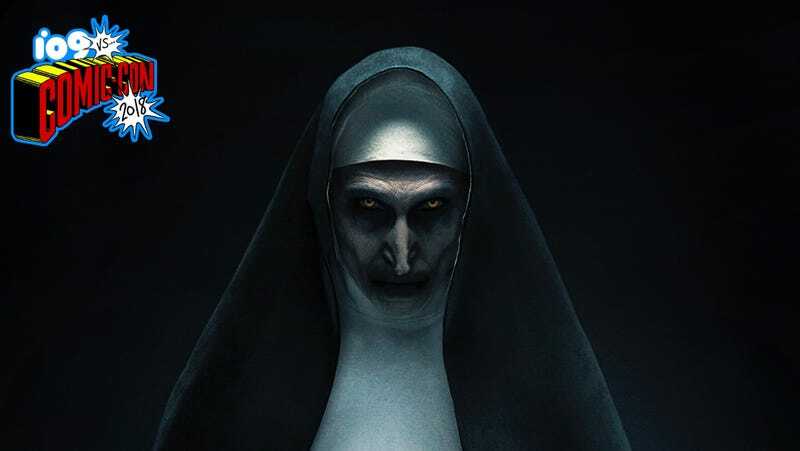 And we won’t have long to wait for this one, either; The Nun is out September 7.